This set of Wireless & Mobile Communications Assessment Questions and Answers focuses on “Multipath Shape Factors for Small – Scale Fading”. 1. The term small scale fading describes the slow fluctuations of received power level due to changes in receiver position. State whether True or False. Explanation: The term small scale fading describes the rapid fluctuations of received power level due to changes in receiver position. This effect is due to the constructive and destructive interference of the numerous multipath waves that impinge upon a wireless receiver. 2. The rapid fluctuations due to small scale fading affect the _________ design. Explanation: The rapid fluctuation due to small scale fading affect every aspect of receiver design such as dynamic range, equalization, diversity, modulation scheme and channel error correction coding. These fluctuations are a function of direction of travel as related to the angle of arrival of multipath delay. 3. An approximately omnidirectional channel model accurately describes fading statistics if directional antennas are employed at the receiver. State whether True or False. Explanation: An approximately omnidirectional channel model accurately describes fading statistics if directional or smart antenna systems are employed at the receiver. Unfortunately, recent measurements and models have shown that the arriving multipath in a local area bears little resemblance to the omnidirectional propagation. 4. Which of the following is not a principle shape factor? Explanation: Three principle shape factors are angular spread, angular constriction, and azimuthal direction of maximum fading. They are exactly related to the average rate at which a received signal fades. 5. Angular spread is a measure of how multipath concentrates about ___________. Explanation: The shape factor, angular spread is a measure of how multipath concentrates about a single azimuthal direction of arrival. It has several advantages like it is invariant under changes in transmitted power. 6. Angular constriction is a measure of how multipath concentrates about ______ azimuthal direction. Explanation: The shape factor, angular constriction is a measure of how multipath concentrates about two azimuthal directions. The measure for angular constriction is invariant under changes in transmitted power. 7. Shape factor, azimuthal direction of maximum fading is a directional parameter. State whether True or False. Explanation: Azimuthal direction of maximum fading is the third shape factor which is a directional or orientation parameter. Its value corresponds to the direction in which s mobile user would move in order to experience the maximum fading rate in the local area. 8. _______of a stationary process is actually the variance of the rate of change. Explanation: Mean squared derivative of a stationary process is actually the variance of the rate of change. The mean derivative of the stationary process is zero; the mean squared derivative is the simplest statistics that measures the fading rate of a channel. 9. Complex received voltage is a summation of __________ that have impinged upon receiver antenna. Explanation: Complex received voltage is a baseband representation. It us a summation of numerous multipath waves that have impinged upon the receiver antenna and have excited a complex voltage component at the input of a receiver. 10. Which of the following is equal to received power? Explanation: The received power is equal to the magnitude squared of complex voltage. The mathematical operation of taking the squared magnitude of a complex quantity is a nonlinear operation. 11. Which of the following is equal to received envelope? Explanation: The received envelope is equal to the magnitude of the complex voltage. The channel is assumed to be Rayleigh fading in order to calculate the mean squared fading rate. 12. Which of the following describes the average fading rate within a local area? Explanation: Angular spread describes the average fading rate within a local area. The average of the two fading rate variances, regardless of the orientation of the measurement, is always given by averaging the variances observed over two perpendicular directions within the local area. 13. Angular constriction affects the average fading rate within local area. State whether True or False. Explanation: Angular constriction does not affect the average fading rate within local area. It describes the variability of fading rates taken along different azimuthal directions. 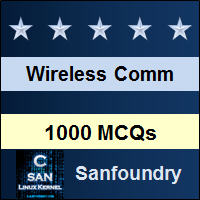 To practice all areas of Wireless & Mobile Communications Assessment Questions, here is complete set of 1000+ Multiple Choice Questions and Answers.